This Instructor’s Desk provides extra storage capacity with a double-door cabinet and a seven-drawer cabinet. A chemical resistant top and sink are provided, along with electric capability. 96″ L. X 31″ W. X 36″ H. Overall. 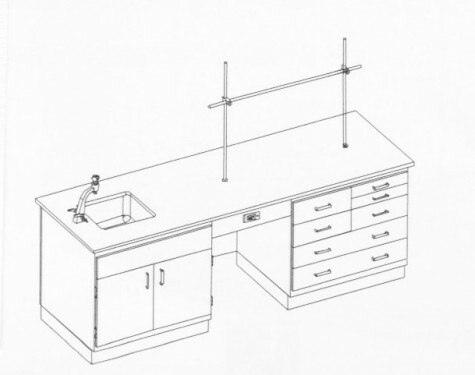 Support cabinets include one sink cabinet and one seven drawer cabinet and one 24″ knee space. Services include one Unicast combination cold water and double gas fitting; one G.F.I. duplex electrical outlet; one shelresin sink with sink outlet, strainer and stopper. Unit is furnished with two upright rod sockets in top and one upright rod assembly.